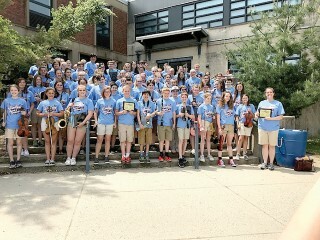 On Friday, May 25th, the Windham Middle School (WMS) seventh and eighth grade orchestra and the seventh and eighth grade band traveled to the Great East Music Festival in Amesbury, Massachusetts. Both ensembles performed for judges under the direction of Morgan Riley, WMS Music Teacher, and they were awarded gold medal ratings! This is the second consecutive gold rating for the seventh and eighth grade band, and the first ever gold rating for seventh and eighth grade orchestra.